The goal of The Ruth Cheatham Foundation is not only to make the battle against cancer easier but also to inspire hope and strength in young adults. A cancer diagnosis is physically, emotionally, and financially draining. With the rigorous cancer treatment schedules and financial limitations of the family, Senior photos are often overlooked. This is our opportunity to support the family and give students a break from the daily grind of treatment. This will be a day to be pampered while celebrating the student’s academic achievements. All photo sessions will be held February 17th-March 10th, 2019. 1. Artistic Rights The Photographer retains the right of discretion on selecting the photographic materials released to the client. 2. Photographic materials. All photographic materials shall be the exclusive property of The Ruth Cheatham Foundation and Paula Kay Photography 3. Copyright and Reproductions. The Ruth Cheatham Foundation and Paula Kay Photography shall own the copyright in all images created and shall have the exclusive right to make reproducations for, including but not limited to, marketing materials, and use, or for display on their website or social media. 4. Client Usage. The Client may use the prints, including digital files, in accordance with the permissions within this agreement. The client’s prints are for personal use only and shall not be submitted to contests, reproduced for commercial use or authorize any reproducations by parties other than The Ruth Cheatham Foundation or Paula Kay Photography. 5. Indemnification. 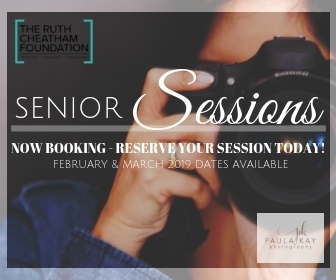 The Ruth Cheatham Foundation and Paula Kay Photography shall be held harmless for any and all injury to client during the course of the photography session and the immediate surrounding events. 6. Miscellany. This agreement incorporates the entire understanding of the parties. Any modification of this Agreement must be in writing and signed by both parties. Any waiver of a breach or default hereunder shall not be deemed a waiver of a subsequent breach or default of either the same provision or any other provision of this agreement. This Agreement shall be governed by the laws of the State of Texas. I authorize The Ruth Cheatham Foundation and Paula Kay Photography to use nad to create images for personal use, online use, and other areas of marketability. I agree and understand that the photos will be taken digitally. I, further acknowledge that I will not be compensated, either now or at any time in the future. I hereby waive all rights and release The Ruth Cheatham Foundation and Paula Kay Photography from, and shall neither sue nor bring any proceeding against the photographer, the Ruth Cheatham Foundation, their agents, or any claim or cause of action, whether now known or unknown, for defamation, invasion of rights to privacy or personality or any similar matter based upon or relating to the use of the photos. I also consent to the use of my name or any ficticious name, which may be chosen in connection with the aforsaid photographs. I hereby release any and all claims in connection with the use of my photograph and name and the reproduction thereof as aforesaid. I hereby waive any right that I might have to inspect and/or approve the photographs and any advertising copy that may be used in connection therewith or the use to which it may be applied. By submitting this application, you are agreeing to the terms as outlined above.